Summary : Yet another high quality and superb tea from Culinary Teas. Both the scent and the taste of this organic peppermint tea will knock you out of your shoes. Not the best of bed-time teas, though, due to the strong and lingering after-taste. Review : Peppermint, for anyone who hasn't read this before, is by far my favorite "mint" on the planet earth. I will try anything that tastes, or supposedly taste, like peppermint at least once. And happily, rarely am I disappointed - I just love peppermint, plain and simple. And so it was that when I placed my last order with Culinary Teas I couldn't pass up a chance to try the sampler size of their organic peppermint tea. As I love their Spearmint Tea, I suspected this tea would be equally good. And it was. Like most other peppermint teas on the market, this tea contains exactly one ingredient : peppermint leaves. The leaves for this tea come from Washington State and, as the name suggests, are organic. A word of warning here. The fragrance of this tea is exceptionally strong! How strong. Well, how's this...all sampler teas from Culinary Teas arrive in a space-age vacumn sealed bag. Once I rippted off the top of the bag, but BEFORE I opened up the zipper seal, the aroma of the peppermint completely took over my kitchen. I loved it! And if you love peppermint, you'll love it too. So, go ahead...be daring and stick your nose in the tea bag. Just don't be surprised to get watery eyes and a itchy nose. But, oh my, what a wonderful and pungent smell. And besides, my kitchen didn't smell that good anyways...the peppermint smell definitely improved things. The aroma of this tea doesn't stop during the brewing process. Indeed, as I slowly poured boiling water over the leaves the fragrance just got strong, almost too strong to smell! Of course, this all begs the question...what did this peppermint tea taste like? Do you dare ask? It tasted like peppermint, of course. And it was really, really, really good. It was in everyway equal to Adagio Teas Peppermint Tea. Basically, if you like that tea, you'll love this one and vice versa. Indeed, a part of me wonders if they use the same tea leaves? In any event, this is a absolutely wonderful peppermint tea. If you love peppermint, stop what you are doing NOW and run over to Culinary Teas to pick up at least a sampler of this delicious tea! Recommendation : Absolutely. 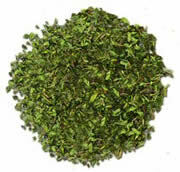 One of the best, if not the best, loose-leaf peppermint teas on the market today. The tea has a super strong aroma, an even stronger taste and a delightful after-taste. And if all you have ever tried is bagged peppermint teas before, hah, what a surprise you'll get when you try this one. Brewing Instructions : Pour 6-7 ounces of boiling water over tea pieces leaves. Let steep for 5-7 minutes. You'll want to use 1.5 to 2 teaspoons of leaves for each cup of tea.